Hey John. Looks great! Beautiful use of colors and contrasts. I appreciate the loose comfortable feel of your composition, all natural as it conveys the focus of the subjects. Always beautiful…I love the developing intesity of the brush work. I LOVE YOUR WORK, THE COLORS ARE DEEP. WILL THIS PAINTING BE AVAILABLE? I love it. It’s so detailed. Moma likes it too. She said you can really draw. The artwork is impressive. I could not tell if there was a way for me to view any additional content. Your art work is a reflection of your personality—— beautiful !!!! It looks great John. The princesses are my favorites. Love the foreshortening. 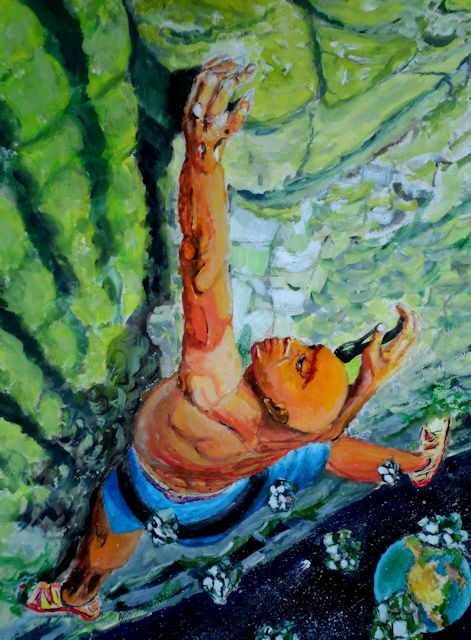 As a climber/artist, nice representation of the sport and interesting concept.